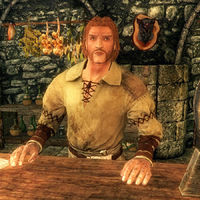 Corpulus Vinius is an Imperial food vendor and the owner of The Winking Skeever in Solitude. He will rent out a room to you for 10 gold a night and offers merchant services. He is the father of Sorex Vinius and Minette Vinius, who both want to take over the inn when Corpulus retires. Until then, they help out with the daily maintenance. Corpulus also has a cousin in Dragon Bridge, the proprietor of the Four Shields Tavern, Faida. Should anything happen to Corpulus, Sorex will take over running the inn. Corpulus can be found welcoming guests and offering his services in the taproom of the Winking Skeever 24 hours a day, without ever pausing to eat or sleep. He will only leave his spot behind the counter if you rent a room for the night, and politely show you to your room. Corpulus wears at set of barkeep clothes and a pair of matching boots. He carries an iron dagger, his key to the tavern, a belted tunic, and a selection of middle-class items and gold. When you approach him he will say: "Welcome to the Winking Skeever, friend." and hint that he might know about a job or two: "If you need a good rumor or two, I think I can oblige..." He will also assure you: "Traitors, civil wars, dragons. Bah. Those troubles don't cross my doorway. So sit, relax." When asked about the name of the inn, Corpulus will reply: "Well, as it turns out, I had a pet skeever when I was a boy and he used to wink." If you express surprise at such a peculiar choice of pet, Corpulus explains that "They were smaller back then." When you tell him that sounds like a good reason, he will respond: "I thought so." He will also tell you where you can learn more about magic and hint that the castle wizard is questionable at best: "Magic? You're on the wrong side of Skyrim. You want Winterhold... that College there. They teach it. Otherwise you can try the Jarl's wizard. I wouldn't, though." When asked about rumors, he will point you towards a few local quests, starting with Lights Out! : "I've heard Jaree-Ra is hanging around the Wells District, looking for new blood to hire." Next, he will point you towards the Bards College: "I think the Bards College might be looking for recruits. You should speak to the head of the college, Viarmo, if you're interested." He also mentions a traveler from Dragon Bridge: "Varnius Junius stopped by here on his way to court. He was worried about something. I'm sure Falk Firebeard could tell you what." Lastly, he heard rumors about a crazy person wandering the streets near the Blue Palace: "People say there's a man wandering the streets near the Blue Palace. He seems distressed but he's not making any sense." When you exit conversation he will say: "Remember the Winking Skeever next time you're footsore." or "Need anything, you just say the word." The Winking Skeever is the only tavern in Solitude and several citizens will point you towards the place. Vivienne Onis will tell you: "Most people head over to the Winking Skeever. If you're not interested in music or drink, you can at least talk to Corpulus. He can fill you in on any of the latest gossip." 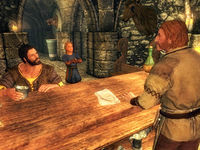 Most guards in Solitude will also recommend the Winking Skeever: "The Winking Skeever's got warm beds and cold mead. You look like you could use both." Lisette, the bard employed at the tavern, will also mention the place: "Come by the Winking Skeever any time you want to hear a tune." and "You should think about staying the night. Corpulus keeps a clean inn." and will add: "Generally, if you want rumors, you should talk to Corpulus." Outside Solitude, a few people will mention the Winking Skeever as well. In Dragon Bridge, Corpulus' cousin Faida will tell you: "I was a barmaid at the Winking Skeever when I met my husband, rest his soul. Wasn't for him, I'd still be working there!" Thaer, the carriage driver outside Solitude, will also tell you: "If you need it, you can get a room for a fair price at the Winking Skeever, just inside the main gate." Most notably, Delphine will send you to the Winking Skeever to meet Malborn during Diplomatic Immunity: "I'll get word for him to meet you in Solitude, at the Winking Skeever -- you know it?" "That's it! I'm not retiring, ever! End of discussion!" Corpulus: "It's been a good week, my boy! Loud customers mean good cheer, and good cheer means a full till! You know, I ought to retire and leave you to run the Skeever, son!" Sorex: "I don't know, father... There's a whole world out there I want to see." / "You'd just spend your time here, bossing me around and yelling for more drinks. You're practically retired already..."
Minette: "I could run the Skeever! You even said I'm almost as smart as you!" / "Why not let me run the Skeever? I already know lots about it!" Corpulus: "Don't be a silly girl! Running a bar's no job for a young lady." / "Hah! A girl running a bar? Don't be ridiculous, Minette!" Minette: "What about 'Auntie Faida' in Dragon Bridge? She runs a bar, and you said she's one of your favorite girls!" / "But you always say you want more girls in the bar to begin with!" Sorex: "Oh, brother..." / "Hah!" Corpulus: "That's it! I'm not retiring, ever! End of discussion!" / "Well, you see, that's a little complicated, and... you know what? Never mind. Guess I'm not retiring anytime soon." Corpulus: "Bring up some more mead, my boy. This cask's nearly tapped!" Sorex: "Yes, father. Which cask should we open?" Corpulus: "Just bring any of them, lad! Can't risk thirsty customers without mead to drink, even for a second!" / "Any of them! Just hurry up! No time for a debate when customers are thirsty!" Minette: "Bring the Blackbriar 195 Berry-Blend. It should be at its peak right now, and if it doesn't get served soon, it'll only go bad." / "We just got a cask of Old Gold 200 that has a crack in it. Better serve it now before it goes bad." / "Fat Toad 190 is always a crowd-pleaser. Father could probably charge extra." Sorex: "Good idea, sis. Maybe you ought to be in charge!" Corpulus: "Yes, yes, fine. Just hurry! Mustn't keep the customers thirsty!" Although he has rumors during early contact, he continues proclaiming to you that he is the one to come for rumors in Solitude even after his rumor topics have been exhausted. Also, many of the other NPCs have "rumor" conversation options where they direct you to speak to Corpulus. This page was last modified on 23 March 2019, at 16:04.